Most students are constantly trying to get good grades which are a race against time. Between school, tuitions, extracurricular activities and tests; the time left for revision is barely enough. Hence, students tend to study continuously for long periods of time with the exams round the corner; assuming that more portion will be covered, within a short span of time. Although this may seem true it is not an effective way to study. Here’s why? By the time students are done with their tests, extra classes and preliminary exams they are left with barely enough time to revise for the main exams or board exams. At such times they resort to inappropriate methods to prepare for the exam and find themselves spending hours together studying without breaks. And then their memory disappoints them all because of the lack of taking breaks while studying. You are probably wondering why taking breaks while studying is so important. 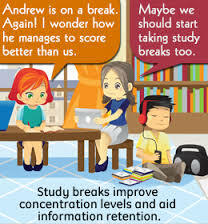 So let’s look at the benefits of taking breaks while studying to get a clear idea. Several studies suggest that the brain has a limited capacity to register information over a long period of time. Just like the body even the brain has limits. When it reaches its limits, your mind concludes that the information studied is unimportant and although you think you are studying your mind is actually just reading the material instead of learning it. At such times it is probably best to take a break and then resume your studies. Studying for long hours at a stretch creates information overload, therefore taking a break is a must. While taking a break your mind relaxes. During the process of relaxation your mind refreshes and is ready to store more information and functions at its optimum level. After continuously bombarding your mind with information over a long duration of time, it is important for you to take a break. Because no matter what age you are nobody can study for hours at a stretch without breaks and it is a proven fact. Besides your concentration deteriorates over continuous study. Hence to improve concentration it is important to take a break. With a refreshed mind you become more focused and are most likely to study well and remember the matter discussed. With a refreshed mind, your attention span is increased thus enabling you to learn the matter fast. Retaining information becomes easy and fast with a refreshed and rested mind. Once the mind is relaxed it is able to function at its optimum level and memorizing information is relatively easier. The pace at which a refreshed mind functions in comparison to an exhausted one are poles apart. Because just as the body needs rest so also the mind requires rest in order to function at its optimum level. When the mind is functioning at its optimum level the amount of time spent in understanding the matter, memorizing the points discussed, retaining or storing the information speeds up and the chances of recalling it when required is higher due to the refreshed state of the mind. For all these reasons it is important for students to take a study break after 30 or 60 minutes depending upon their attention span. This will not only refresh your mind but will also improve your concentration. Thus you will be able to cover more portion within a short period of time. Besides taking breaks within these time frames will assist you in memorizing material well and it will improve your grades nonetheless. So take breaks and yield the fruits of your hard work. I tried taking breaks while studying and it really helped me. Thanks! Thank you for your feedback and I am glad to know that is was helpful. How long should a break last when you are studying for an examination? A break should usually last for 30 minutes or 60 minutes. Taking breaks is specific to individual capabilities.